A few facts about Racing Penguin that should jump right out at you when you first start the game is that while it may appear to be one of those games aimed squarely at child-gamers, it actually isn't. Oh, it does offer you the ability to make it a game kids can play - and will like to play, mind you. On the start screen the first thing you will see is that the Multi-player side is locked. The second thing you will see is the Shop button. Tap that and you can unlock a number of modifications to the game - the first of which is Kids Mode. 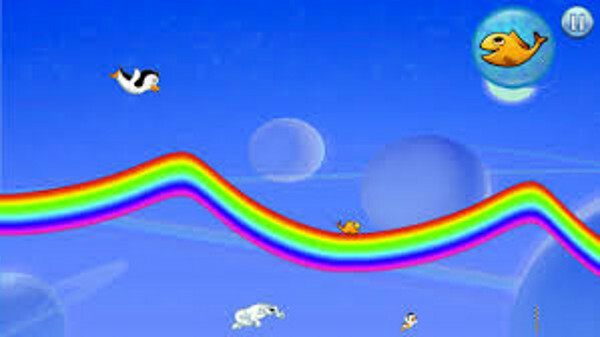 What Kids Mode is in simple terms is the game minus the bear that is chasing the penguins. Meaning your kids will not freak out that a bear wants to EAT their penguins! The problem with that though is that the revenue side of the game is concealed by the login requirement for iTunes. So when you see a game enhancement you might want to add, the game does not tell you how much it costs - you actually have to log into iTunes in order to see. But we have you covered there! The Kids Mode cost is $19.99 - it alters the game by making flying easier, and of course, removing the bear. 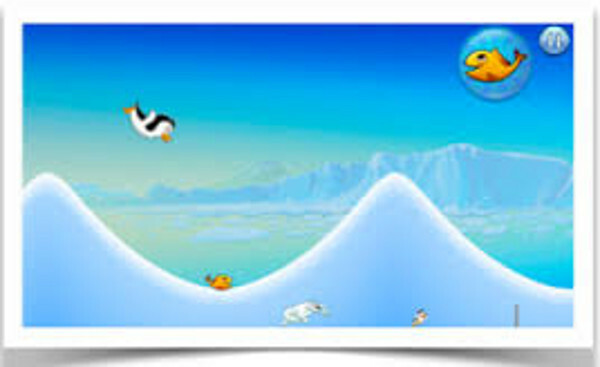 Super Penguin is $11.99 - it alters the game by allowing your penguin to go higher, faster, and have better control. Pnguinette costs $$6.99 - and this unlocks a cute girl penguin which, if your kid gamer happens to be a girl type, you might want. Magic Penguin costs $$29.99 - and adds the ability to teleport uphill, and delivers a magic boost for every perfect slide. In addition to those add-on elements there are also resources you can purchase, which include Super Fish that give a boost when needed in game, and cost $1.99 for 3, $6.99 for 15, and $19.99 for 50. Bonus Stars - which increase your star count and are used to unlock levels, cost $1.99 for 1, $5.99 for 5, and $24.99 for 30. The game uses moderate advertising as well as part of its revenue stream, but if you buy ANYTHING from the listed items above, ads are then removed from the game. You can also restore any of the penguins you purchased that were subsequently eaten by a bear for the low price of .99 cents. The ads you will see for the most part appear as banners at the bottom of the play screen but they are given a moderate rating due to the presence of full screen pop-up ads that will appear every so often between levels. 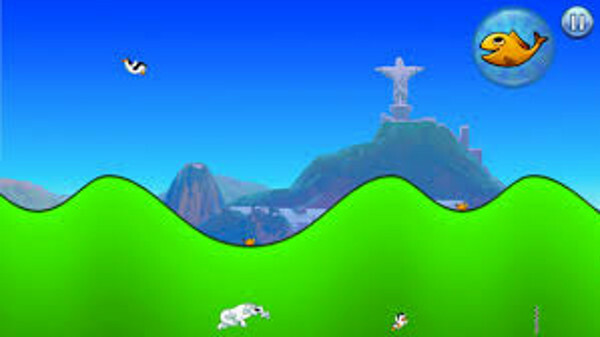 The game play takes a bit of practice to master in terms of the controls, since the objective is to apply the touch to boost speed when the penguin is in a down fall or slide, but not apply pressure when they are sliding up or flying. Once the player learns this though, the true challenge then becomes beating the set times in order to unlock all three starts for the level - the stars being important since getting new sections of the game and its levels unlocked requires you to obtain them. But before you start thinking, hey, easey-peasey! Bear this in mind... Despite the addition of Super Fish in the various levels you still have to worry about that bear once it starts to factor, and that bear? Yeah, that bear is a hungry bear! To put that in perspective for you, as soon as you start playing the bear is coming - there is a small bear approaching meter at the bottom of the game play screen. Bottom line? You want to get to the end of the level BEFORE that bear gets to YOU! Heh. The graphics and sound are nice. Cartoon-like in their over-all appearance, and bearing in mind that we are talking about a mostly snow-covered environment, they offer a pleasing and entertaining play experience. The sound effects and background music is upbeat, though when the bear starts to get close you will hear it. Mastery of the controls to become a two-star player is well within the reach of the average player - getting your mad skills to the three-star level though, that takes some serious practice and developing a keen grasp for just the right time to dive. That said, the game offers a very fun and entertaining premise, that is perfectly suited for the mobile sort of app/game in which game play needs to come in bite-sized chunks - as it easily does here. 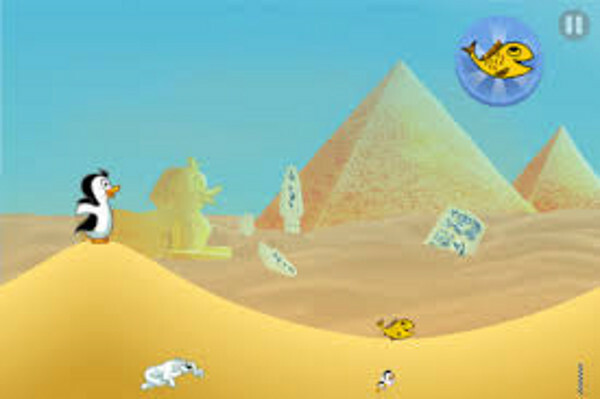 With respect to the Kids Mode... That bear now, it is not going to you know, shred the penguin in a graphic way or anything, but losing a penguin to it - especially a penguin that the little gamer begged you to buy for them? That may, depending on the age of the gamer, be a bit too much. So parents of younger gamers will want to consider getting rid of that bear. Just saying. All in all the game has the right mechanics and presentation, and is both fun and more than just a little addictive! NOTE: This game requires at least 512 megs ..
Are all Princesses really waiting for Princes ..
Get on a mining adventure in this sequel .. The fence has fallen down again, one after ..